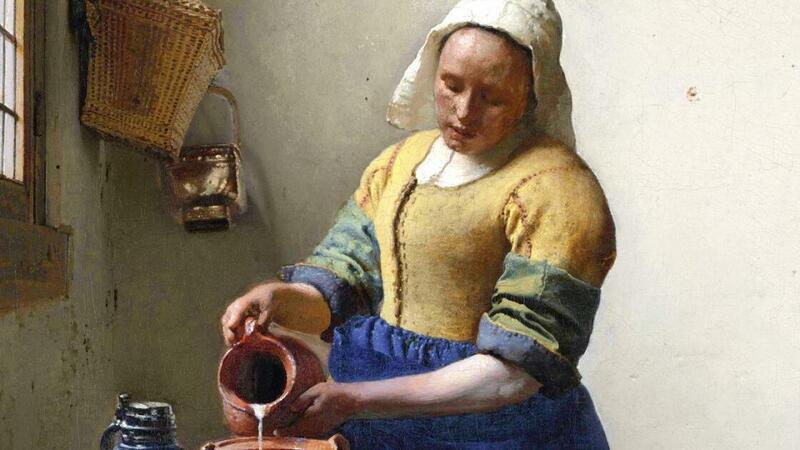 The Milkmaid by Johannes Vermeer was completed in 1657-58, at a key juncture in Vermeer’s career. This was the point that he perfected his representation of the play of light. The painting, which is in the collection of the Rijksmuseum in Amsterdam, features a young maid absorbed in her duties. 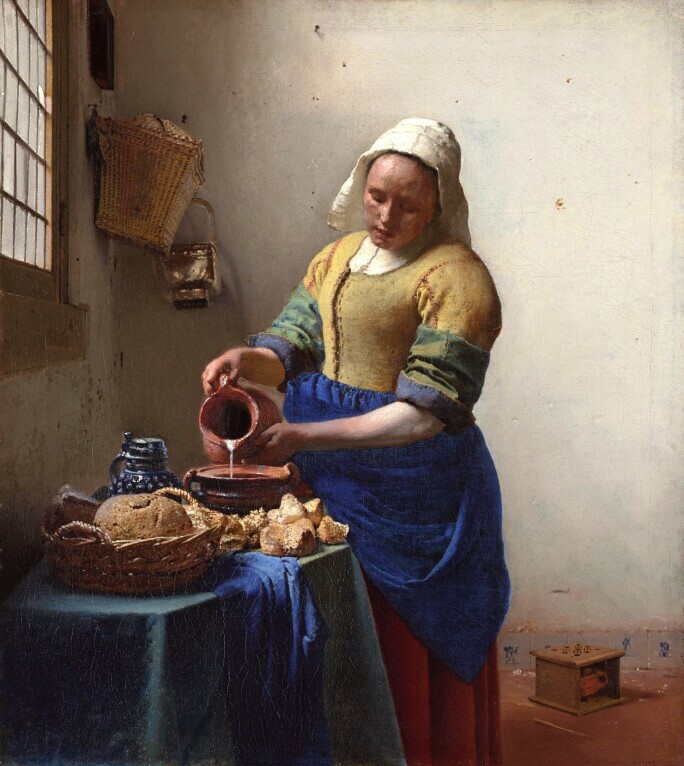 Many art historians believe she is pictured making bread pudding – suggested by the slow measured trickle of the milk being poured into the pot. With light creeping into the composition from the high window, it is an intriguing image of a simple but enigmatic subject. In fact, a female figure immersed in an insular activity was one of Vermeer’s favorite themes. He painted women playing lutes and virginals, writing and reading love letters and braiding delicate pieces of bobbin lace. Johannes Vermeer, Christ in the House of Martha and Mary, circa 1654–55, in the collection of the National Gallery of Scotland, Edinburgh. 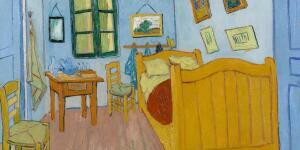 There are only 35 known extant works by Vermeer. 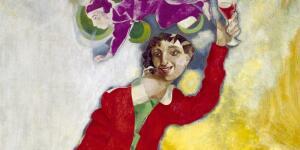 A survey of those paintings leads to many of the world’s greatest art institutions. 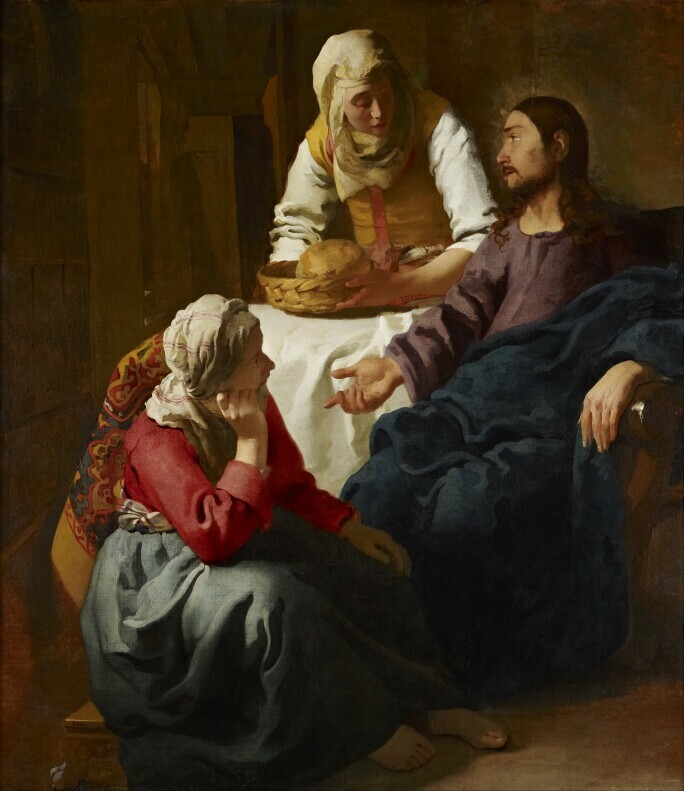 His earliest surviving work is Christ in the House of Martha and Mary, painted circa 1654-55, which is in the collection of the National Gallery of Scotland. Other examples sit in the holdings of the Rijksmuseum, Amsterdam; Metropolitan Museum of Art, New York; Mauritshuis, The Hague; The Louvre, Paris; and the Royal Collection housed at Buckingham Palace. 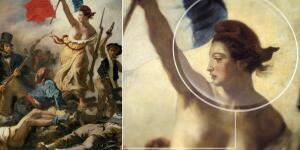 Other pictures have had less fortunate fates. In 1971 a 21-year-old waiter stole The Love Letter from the Centre for Fine Arts, Brussels, and buried it in a forest. It was found, although badly damaged. And The Concert, a group portrait from 1664, was stolen from the Isabella Stewart Gardner Museum in Boston in 1990 and has never been recovered.